Israel's prime minister says he can prove that Iran still wants to build a nuclear weapon. Israeli Prime Minister Benjamin Netanyahu says Iran's been lying to the world about its nuclear program — and he claims to have the evidence to prove it. 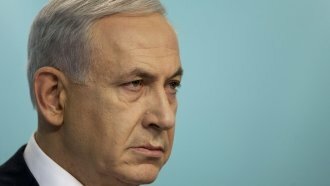 According to Netanyahu, Israeli intelligence has obtained tens of thousands of Iranian files detailing an old program, "Project Amad," which would have allowed Iran to secretly develop nuclear weapons. Iran has long denied pursuing nuclear arms; the rest of the world has been skeptical of those claims. Netanyahu's presentation didn't directly prove that Iran has violated the 2015 agreement constraining its nuclear program. But the prime minister claims the documents show Iran still has plans to develop a nuclear weapon. President Donald Trump said Netanyahu's revelations prove Trump was "100 percent right" about his long-time skepticism of the 2015 deal. Trump faces a May 12 deadline to decide whether to pull out of the agreement. Trump recently hosted the leaders of both France and Germany, who lobbied him to stay in the pact. Trump hasn't publicly stated his intentions on the Iran deal yet.